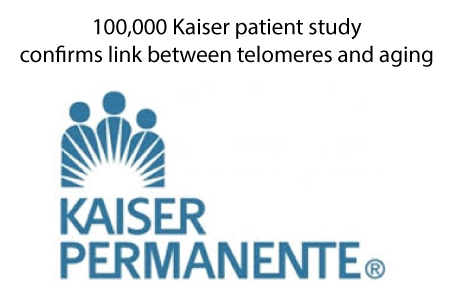 In long-awaited and landmark study published yesterday in Genetics, Lapham and 28 other authors collaborated to report telomere length in a cohort of Kaiser patients who gave saliva samples. They will be mining and publishing from this data for a while but an important aspect of this is the attention to test standardization and controls which are important given the errors inherent in the standard quantitative PCR methods. If there is something that could regrow telomeres, such as TA-65, then it might be worth your while to consider this unless you are 100% certain that the risk is too great or that this decline is not related to the negative consequences of aging as my stem cell theory of aging and disease suggests. 1) A survivor artifact exists with the older people who are genetically endowed with more efficient telomerase activity and are therefore more fit in every way. The insufficient telomerase activity in the deceased members has already caused their deaths. 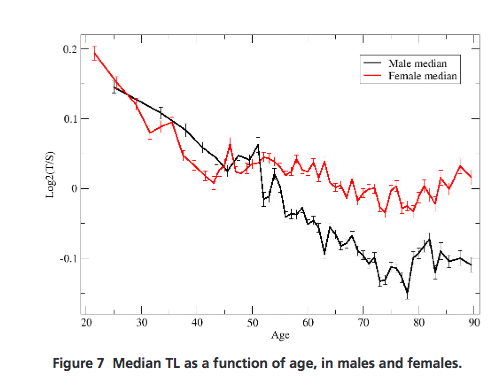 2) The stem cells of people over 75 are in crisis known as senescence and are unable to kill themselves, leading to lengthening and hypervariability (like the hair on an old street person). 3) There are few viable replacements left so the niches are populated by damaged stem cells which uncontrollably lengthen their telomeres as above. 4) The majority of cells continue to shorten their telomeres but the stubborn and hard-to-kill senescent types have increased sampling representation by virtue of their telomerase activity and longer lives. Given the mountain of evidence linking mortality to shortened telomeres, the expressed written consent of captive members to have their blood and saliva tested for research purposes, and the fiduciary duty of underwriters to consider risk stratification, will there be any protection from ‘cherry-picking’ and denial of coverage based on telomere measurements? Telomere measurement may prove much more reliable for prognostic risk-stratification than single nucleotide polymorphisms, cholesterol tests, and perhaps even diabetes and blood pressure monitoring, which they are already trying to manage with bribes, apps, shaming, and rate hikes. Welcome to the machine! Thankfully, the highest goal of health maintenance organizations will be perpetual premium payments; so as long as there is inter-HMO poaching, no intramural dumping of higher risk individuals or draconian rate increases, the incentives are properly aligned to keep people healthy, paying premiums, and low resource-utilizing, even with the introduction of involuntary telomere risk profiling.